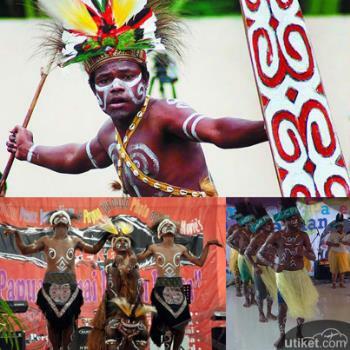 Sajojo dance is a typical dance originated from Papua, the largest island located in the eastern region of Indonesia. This dance is a kind of social folk dance or can also mean as a welcome dance to greet guests. This dance is quite unique because it prioritizes the movement of hands and feet and can be performed by a few dozen people at once. Each dancer can jump, move forward, backward, left or right with rhythm and motion assertiveness which of course each dancer try to move similar with other dancers. Sajojo dance can be done by anyone, old, young, men and women in groups. Even so, there is no main dancer in this dance. Harmony of dancers’ motion with dynamic rhythm makes this dance special. This dance makes the dancers feel as a part of the group so that each dancer will always keep their movement the same with others’. Originally this dance started to be known in the 1990s among the military who served in East Timor (Timor Timur), Maluku and Irian. This dance usually starts from left foot with typical rhythmic music, upbeat and undeniably happy. The lyrics of the song in this dance tell the story of a pretty girl idolized by youngsters in the village. This dance is becoming increasingly popular so that there are community groups holding competition for this dance. Even today, Sajojo Dance has been modified becoming a gymnastic exercise without leaving the original elements.